Hey friends. 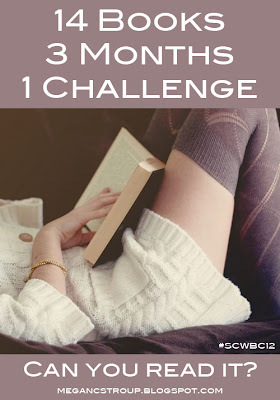 It's Thursday, and even though the.book.chat is on hiatus during the Blogger Book Swap, I wanted to share a cool book challenge I'm participating in that starts today. Megan held a Summer Book Challenge that I didn't finish due to my reading drought that I suffered all summer. I have faith in this challenge. I've decided not to choose books I'm not likely to read. I'm even hesitant to share the list with the fear that I might jinx it and be then doomed to not finish it. 10 points: A book that takes place in your home state: Still looking... Do you know a good book set in Alabama? I love that her challenges involve scores and points and causes us to seek out new books we might not have seen otherwise. If you like to read, I do hope you join in. As for the Blogger Book Swap, everyone should have completed their shopping and hopefully their shipping. If you haven't shipped yet, no worries! Just try to ship this week so that your partner will receive it in time to blog about it and link up next Thursday. If it seems that people need more time, we can extend the link-up for an extra week. If you are having a problem at all, please let me know. Hope you're all enjoying the swap! I'm feeling a little overwhelmed with all the books that need to be read...plus the book swap book lol. I haven't started reading yet! P.S. - I'm glad my challenge started on a Thursday. That fits right in with your editorial calendar! i heard looking for alaska by john green is good (set in alabama). how about a good one set in NC? I can't recommend one, as I've only read TKAM, but hopefully one looks intriguing to you! I'm doing Ender's Game as well (as sci-fi genre). I can't believe I haven't read it yet! I read a brief excerpt and I got really, really interested in it. I hope you enjoy The Unbearable Lightness of Being. I read that for the last book challenge and while it's a little different, I really enjoyed it. It takes me 2 months to read 1 book. lol I don't have the attention span for this, but Kudos to you!! !